It’s all fun and games until you find a dead person in your bedroom. And I so didn’t need this today. As if her dysfunctional, fractured family and absentee best-friend weren’t enough to deal with, Macey is getting some serious flack after her recent scathing review of the band 'Pashon' and now she has a ghost hassling her. Well, he says he isn’t a ghost, he’s just astral travelling, but either way he’s a pain in the neck and Macey doesn’t need the extra drama. Unfortunately, things are about to get much worse as Macey starts finding threatening notes and her family issues go from bad to unbelievable. Maybe this mystery ‘traveller’ can help her sort things out so that her life can get back to normal or maybe gorgeous surfer Finn is the one she should be looking to for help. Feisty, intelligent and opinionated with a quirky sense of humour, Macey Pentecost is the star of Kaz Delaney’s latest supernatural teen mystery romance Almost Dead. A companion to her 2012 award-winning Dead, Actually, this book shares the same setting and background but draws a different character onto centre stage. I was drawn into the story of Almost Dead immediately and read the book in more or less one sitting, loving the strong female protagonist, the humour, the unexpected twists of the mystery and the great dynamics between the main characters. As with Dead, Actually (KBR review here), the dialogue between the characters and the unfolding mystery will keep readers turning pages and promising themselves ‘just one more chapter’. The supernatural elements of this story are never spooky or creepy, but are instead simply a way to add another dynamic to the relationships and tensions of the story. They also offer wonderful moments of humour and, of course, play a role in revealing the clues that eventually lead to solving the mystery of the threats Macey is receiving. 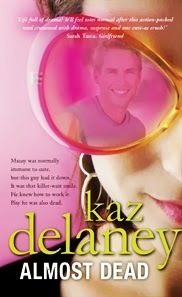 I love that Kaz Delaney’s books are so wonderfully engaging. The relationship dynamics are fun with an element of romance but there is no heavy sexual tension to exclude younger teen readers from enjoying the story. The balance of mystery, romance, humour and a truly interesting plot will appeal to readers from early teens onwards, even extending into adult readers looking for a quick, entertaining beach read. The Australian setting also offers a wonderful opportunity for Aussie teens to read a book with familiar place and pop culture references. I’m a huge fan of Kaz’s teen novels. This book has hardly hit the shelves and I’m already keen to see what she will come up with next.